Newcomer Family Obituaries - Marsha Elizabeth 'Mama Kush' Blood 1979 - 2019 - Newcomer Cremations, Funerals & Receptions. Marsha Elizabeth "Mama Kush" Blood, 40, of Denver, passed away February 3, 2019. She was born January 17, 1979 in Marietta, Ohio, the daughter of Mark and Margaret (Browning) Dunfee. Marsha loved to spend time in the mountains. She used to go to Water World constantly when Damien was little. She would enjoy going Downtown for New Year's each year, no matter the temperature. She will be remembered as a free spirit who took great pride in helping other people. Marsha loved to go to eat. She also enjoyed watching movies. 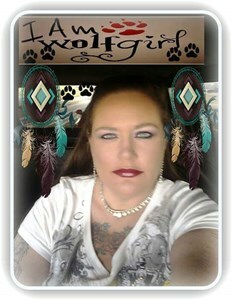 Also known as "Mama Kush," Marsha's spirit animal was a wolf and she truly believed in her spirit animal. She loved hard and lived free. Marsha is survived by her loving husband of 22 years, Jeremy Blood; seven sons, Damien A. Blood, Robert Riley, Justin Biggers, Jaleel Gude, Ryan Hoag, Anthony Russell, Hector Quezada; two daughters, Angelica Blood, Kimberly (Mark Fritzlan) Marie; 2 grandchildren; mother, Margaret (Melvin) Rodgers; father, Mark (Paula) Dunfee; seven brothers, Matthew Dunfee, La Rock Vigil, Michael Maloney, Monster Mike Patterson, Ernest, E-Rock, Donut; five sisters, April (Fred Loftin) Ferguson, Shala Salazar, Christine Gavin, Kelly Bartholomew, Lanie Rhoades; step-brother, Melvin Rodgers, Jr.; two nieces, Andrea Dunfee and Rebecca LaKay; seven aunts, Sara Lee, Martha Macy, Mary, Fatima, Debrorah, Patsy and Darlene; two uncles, Robert and Ben and two cousins Jennifer and Jessica and many other brothers, sisters, aunts, uncles, nieces, nephews, extended family and many friends. She was preceded in death by her sisters, Lydia Beucher and Bridgette Riley; her aunt, Nancy Purvis; her uncles, Tim Browning and John Browning and her grandparents, Rev. Charles W. Browning, Virginia Browning, Mull Dunfee and Ruth Dunfee. Memorial Contributions may be made to Marsha's family to help with funeral expenses. To share a memory of Marsha or leave a special condolence message for her family, please click the Share Memories button above. Add your memories to the guest book of Marsha Blood. Where do I begin and how do I begin to make sense of why you are no longer with us. I always thought you were invincible and would definitely be here after me. When I met you, Marsha, you were if I am correct about 15-16 years old. You would come and get me and we would drive around in your mom's van and hang out, we became best friends after that for so many years you became a sister to me. I remember when you were pregnant with Damien and watching him grow up into the most responsible young man and you and Jeremy having every part to do with that. I remember you all living with me and me living with you and trust me my little sis that will never leave me ever. I know we grew apart and I am sorry for that I truly am. If I could take back not being there for you like I should have I would and now it's too late. I miss you and I love you and trust me that has and never will change. I do not know why someone as beautiful and kind as you were taken so early as you had your full life ahead of you to enjoy, to enjoy your husband you loved so dearly and to watch Damien grow up to be the young man he is today. I will never take for granted again the kindness anyone has shown me as you have shown that to me since we met. I will always thank you and Jeremy for making my heart whole again when you introduced me to my best friend, my husband I have now been with for 10 years, Marsha I will never forget that and I know I have thanked you before but I want to tell you again, Thank You sure wish it was in person. I am so sorry I could not tell you all this in person but wanted everyone to know how special you are and that you always put others before yourself. I love you RIP until we meet again. I have a lot of memories when it comes to Marsha. We met when I was 11. I still to this day don't know why she liked me? She liked rap and r and b. I liked alternative and industrial music. She was popular and i was not. Her friends didn't really like me. But she stood up for me and told everyone to shove it basically. When I was 16 and came out to my parents and got kicked out of the house. Her mother and her adopted me. And we lived together for about a year. She became my sister. I was there when she got pregnant with Damien and I was there after he was born. I also was able to be there when she got married to Jeremy. We had ups and downs, fallouts, but we always seemed to be able to kiss and make up. But this last stretch we did not. But there was always love for one another. I'm in complete shock over all of this. And I will always hold special place in my heart for my best friend and sister. My prayers are with the family. Peace, love and respect always!